September 6, 2006 - Popular custom bike builder Billy Lane awaits results of blood alcohol tests after he was injured Monday night in a head-on traffic accident that killed a man riding a Yamaha moped. Ciabatti: ?Unless the AMA adopts World SBK Rules we will have to withdraw.? Speaking in the paddock at Brands Hatch last weekend, Ducati Superbike Director Paolo Ciabatti said that Ducati will not continue in the AMA Superbike series unless there is some last-minute agreement in the AMA to adopt World Superbike rules, including an increase to 1200cc displacement for Twins whenever the FIM approves it. Doohan, 41, of the Gold Coast, has been charged with assaulting a bouncer at Darwin's Honeypot Club early on Saturday, the ABC and the Gold Coast Bulletin reported. Northern Territory police refused to confirm Doohan was involved, but said a 41-year-old man arrested at 3am on Saturday morning had been charged with assault and failing to leave licensed premises. LEEDS, Ala. -- A crash at Barber Motorsports Park is under investigation. Shelly Gruber, 29, of Lithonia, Georgia, died Tuesday, two days after the motorcycle he was driving crashed at Barber Motorsports Park. Gruber was on a day trip to the park, offered by Sportbike Tracktime, which allows you to ride your motorcycle around the track. The company bills itself as providing the thrill of riding on a racetrack: no cars, signals, driveways, cops, gravel, double yellow lines or other distractions. It states it provides the pure joy of riding in a safe and controlled environment. Now that full traction control is legal in AMA Superbike and Formula Xtreme and limited systems are legal in AMA Superstock and Supersport ? effective immediately -- who will have the time to obtain and implement the systems by the end of the current season, which only has five rounds remaining? That was the question raised by veteran AMA racer Miguel Duhamel when Roadracingworld.com contacted him Monday morning seeking reaction to the immediate legalization of traction control systems in AMA Pro road racing. ?It?s surprising that they decided to do it so abruptly right now,? said American Honda?s Duhamel. ?I don?t know how many people have the time to do it now that it?s legal or whatever. I don?t know who?s going to have time to implement a system like that. I don?t think it can happen overnight. It might be bad in a way, because whoever?s already been doing it or have an idea how to do it, for them to not have any more barriers might scoot them back in front. MotoGP Rolls down Hollywood Blvd. In advance of the 2006 Red Bull U.S. Grand Prix, the following MotoGP riders will take to Hollywood Blvd. at 3:00pm on Tuesday, July 18th, at 3:00pm PST [Pacific Standard Time] for a brief ride and photo opportunity for their fans. The street will be closed from Highland to Orange Ave, the length of the Hollywood and Highland complex, and in front of the Chinese Theater. All of the MotoGP fans in Southern California are encouraged to come out and see their favorite riders in this unique opportunity in America. The riders attending will be.. CLICK read more..
Is this the 2007 Suzuki GSX1400R Hayabusa? We all know it, Suzuki will be upgrading its Hayabusa for the 2007 model year. The compeititon dictates everything the manufacturers do these days and Kawasaki has launched its most serious attack to the top speed crown since the very first ZZR in the ZZR1400. When it comes to horsepower Suzuki has led the pack for years not giving any opportunity to the other manufactures of passing them up.. CLICK read more.. 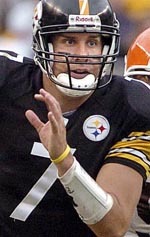 Despite being tossed high into the air after his made-for-speed motorcycle rammed into a car, causing him to smack his head on the car's windshield, Roethlisberger escaped career-threatening injuries. CLICK read more..
Pfeifer Wins Big in Vegas! Well three CCS Southwest races anyway! Jack Pfeifer on his Pirelli equipped Kawasaki ZX10R created quite a stir with the regular CCS competitors who attended the races on the Las Vegas classic course when he won the Unlimited GP race on Saturday and in doing so breaking the Unlimited GP race win streak of Mark Ledesma who had gone undefeated this season at all the previous CCS Southwest rounds held so far this year.